This property is 3 minutes walk from the beach. 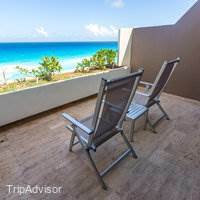 Offering bright, modern rooms with a private terrace overlooking the Caribbean Sea or Nichupté Lagoon, this beachfront resort is 25 minutes' drive from Cancún International Airport. 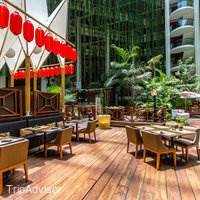 Fine restaurants and nightlife are featured. 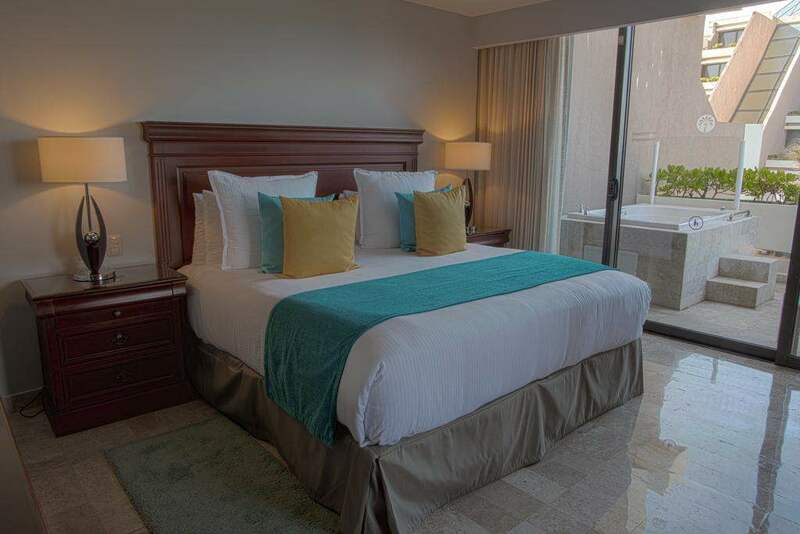 Rooms at the Paradisus Cancun All Inclusive Resort & SPA provide spacious windows and a rain-style shower. 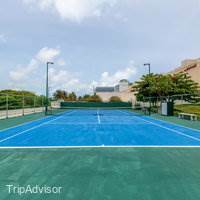 A 32-inch flat-screen cable TV, minibar and air conditioning are included. 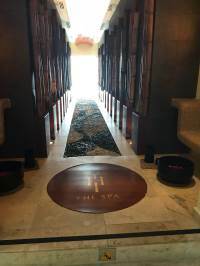 Guests have access to YHI Spa, offering a variety of traditional therapies and also Ayurvedic (Indian), Balinese and Thai, and can learn how to dive or perform Tai-Chi. 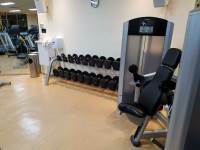 A fitness center, 3 pools and water sports are also available. 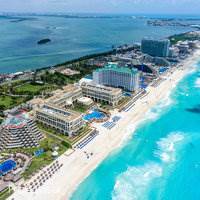 The Paradisus Cancun All Inclusive Resort & SPA offers 10 restaurants including the poolside La Veranda and the elegant Ku-Nah. 9 bars are also located around the resort. 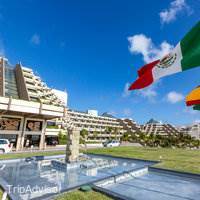 The Paradisus Cancun is less than 6.8 miles from Ventura Park and 30-minutes´drive from downtown Cancun. Great hotel, good service and awesome food. I recommend it. 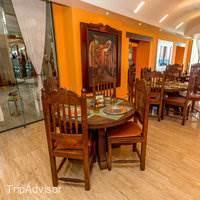 Royal service was great best breakfast at La Palapa restaurant, the market place restaurant is a plus with their quality of meats and fresh. Daniel was very detailed oriented with us and gave us a great service. Great Cancun Hotel in the middle of the "7"
Having stayed and a wonderful hotel in Playa del Carmen, and pretty good resort in Puerto Morelos, I wasn't sure how much I would like being on a "Miami Beach" strip of hotels in the middle of Cancun (which is shaped like the number 7). 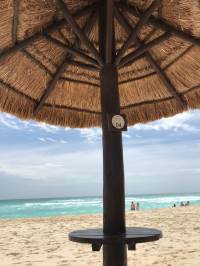 Well, the Paradisus Cancun was great! 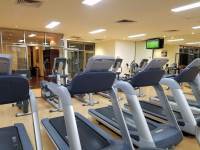 First of all the staff was friendly and accommodating to a person. Check in to the Royal Service (which I HIGHLY recommend!!!) was a breeze. 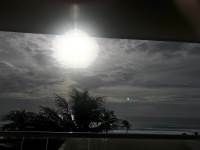 The beach/ocean facing room was very nice and the view was beautiful. 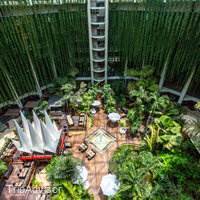 Even the inside of the hotel, shaped like a pyramid, is beautiful, with lush greenery and decorations. Food in all the restaurants was very good. The Royal Service portion of the hotel adds music in the "lobby" at dinner time. Finger foods and top shelf drinks are always available during "waking" hours, and are included in your stay. 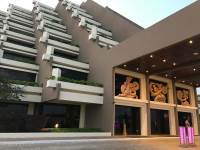 Royal Service also means that all food and top shelf drinks are yours anywhere on the grounds of the hotel. Beach chairs in a roped off area for R.S. is constantly attended by waiters bringing you food and drink. R.S. has it's own large pool. 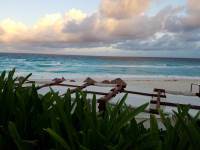 The beach was beautiful white sand and had minimal seaweed issues, unlike beaches south of Cancun. The water...GORGEOUS! 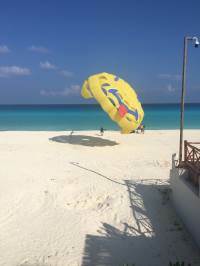 To top it off, Paradisus Cancun is right across the street from a large water sport facility where most people visiting the strip will end up to either rent boats, cruise, scuba, water park, etc, but staying here you simply walk across the street! I would absolutely go back here. First Vacation with Toddler Great Success!!! 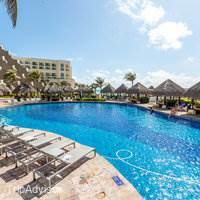 We stayed at Paradisus Cancun with our 1 1/2 year old daughter the first week of October. Let me just say it was... wonderful and as relaxing as you can get with a toddler!!! My husband and I Paradisus lovers!!! 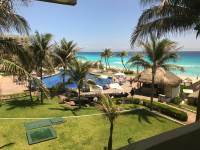 We got married at Palma Real in Punta Cana, we had our honeymoon at La Perla in Riviera Maya and now this first family vacation at Cancun. We are used to traveling with Royal service and now with the baby we were not sure how it would go. 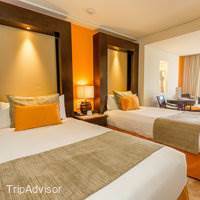 We decided to do family concierge because of the great reviews and they did not disappoint. 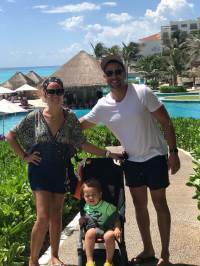 Family Concierge:Rodolfo, Maria and Alexander were amazing. They brought gifts for our little one at night and everything is done with a smile on their face. They also brought my husband and I bottles of champagne, wine, a nice tequila, chocolate covered strawberries. You name it they had it...they made us feel special. 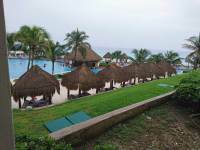 *Communication:We were there during the week that Tropical storm was going to pass over cancun. Let me say nothing happened but the hotel was great with communicating with us about changes and updating us regarding the storm. Thank goodness we just got rain. We used what’s app to communicate which is very good. We left our daughter one day at the baby zone to enjoy some adult time at the spa. She was hysterical and lasted about 20 min but maria, our butler,contacted us right away via what’s app we were there in a matter of minutes. THANK YOU!!!! The service was amazing and well worth it so if you have a family it’s a MUST! Things happen....it was not always perfect... there was one instance when we wanted to push back a reservation because our daughter went down for a late nap after the pool but we did not get a response from our butler.We managed to make it to the restaurant 30 minutes late and they did not want to sit us because they only wait 15 minutes for reservations, which is completely understandable. Overall, they sat us and the meal was fabulous at Market Grill (one of the best dinners we had). 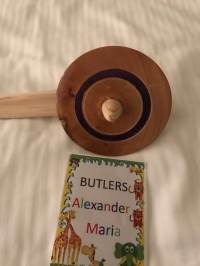 We just wish our butlers would have responded. If it can’t be done it can’t be done... but a response would have been nice. We also asked for whole white milk be stocked in our mini fridge instead of chocolate milk. Several times it was not there and we either had to call or go pick them up at family cosierge. However, This did not ruin our trip at all we had a great time and would do this again. Our room was updated, clean and the AC was great. Again, Family concierge is well worth it... this will be the only way we travel to a Paradisus. Pool:Pool- the adult pools are very deep. I am short and could not enjoy it at all. We either had to stay at the kiddie pool with our daughter or go to jacuzzis like pool within the pool. It would be nice if the pool was not as deep. Also when you get in there is a huge step at the bottom so please be careful I scrapped my knee on it. The Kiddie pool was fun for the little ones. We were there most of the time. A big thank you to Veronica and Sophania who kept our drinks coming. They were friendly made great suggestions and they wanted us to relax on vacation. Such hard working people... ****Restaurants: This is the only reason we gave this resort a 4. Most of the indoor restaurants are extremely hot... They need to invest in good air conditioning. Naos- we ate here for breakfast, lunch and once for dinner food was very good but sometimes cold. One thing my husband and I did not like is that at the omlette station they did not flip the eggs before they add the veggies. We tried both stations numerous times and it was the same. There were always lots of good options at the buffet.A big thanks to Gaudencio, excellent waiter, who was amazing with our daughter during breakfast and lunch. Also, thanks to Abraham and Arturo very pleasant and honestly just wanted to make sure we we had everything we needed. Enso— Just amazing food. They made a special dish for my daughter who eats low sodium. Chicken, white rice and veggies. She ate most of it. The fried rice is amazing and so were the spring rolls. OMG! Still thinking about our dinner there.... Veronica and Ramon were on point with everything. The food was delicious. It is extremely hot in this restaurant which is understandable because it is outdoors. Market grill- We had breakfast a couple of times. we did not like it for lunch because the food was cold. You can ask for pizza or other options on the menu which were very good. Dinner was rodizio style was Fantastic!!!! We want to thank Manuel and Jesus for making our experience very special after having a tough night with the baby. We also want to thank Katia at market grill.Fuego was also amazing!!! The steak was just perfect. We loved our dinner and the waiter got us spaghetti with Butter for our little one. She loved it! Thank you to our waiter Jorge! Fernando at fuego was also very pleasant and wanted us to feel comfortable.The only negative is the extreme heat in this restaurant. It is indoors and i just wish there was AC. It makes it uncomfortable to enjoy your delicious meal when you are drenched in sweat. My husband and I loved the food but the heat was unbearable at times. Bana- My husband and I do not eat seafood but Bana has great options. The chicken tempura roll was to die for!!! Our waiter, Luis, at this restaurant was also wonderful. Our baby had a special child corn rice and veggie dish which she enjoyed. amazing for dinner. Mole- was okay... traditional mexican food... super hot in this restaurant. We asked for fans and the staff accommodated. Our daughter was uncomfortable and we could not enjoy the full experience. A big thank you to Roberto our waiter. YHI Spa is great. A big thanks to Sandy who did my massage she was excellent and friendly. 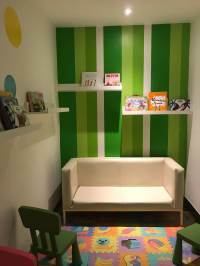 The Baby zone is for children 1-4 and the Kidzone is for the older kids. We visited the baby zone and the staff was fabulous. Our daughter kept saying she wanted to go see Lucy. A big thanks to Lucy, Abby, Aurora for their great work. One suggestion is that they need to do better with cleaning the baby zone. When our daughter was picked up her feet were filthy. I started to put socks on her when she would visit. So if you are looking for a resort for family this is the place... I know people say too many kids everywhere but that’s what it’s about FAMILY... if you would prefer adults only try Royal Service. Our visit with our toddler was a Success! 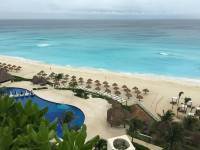 However, i want to point out that this wouldn’t have been the case had it not been for the wonderful staff at Paradisus Cancun. They work very very very hard... A bit suggestion is to TIP—Even though every one does their work with a smile... tipping does go a long way. They deserve it!!! We arrived before they were expecting a hurricane to hit Cancún which never happened. Everything about our stay there was impeccable but above all I would like to recognize the very hardworking staff. Always kind and smiling. I’m impressed. Our server at night Mario did a great job. Excellent service. 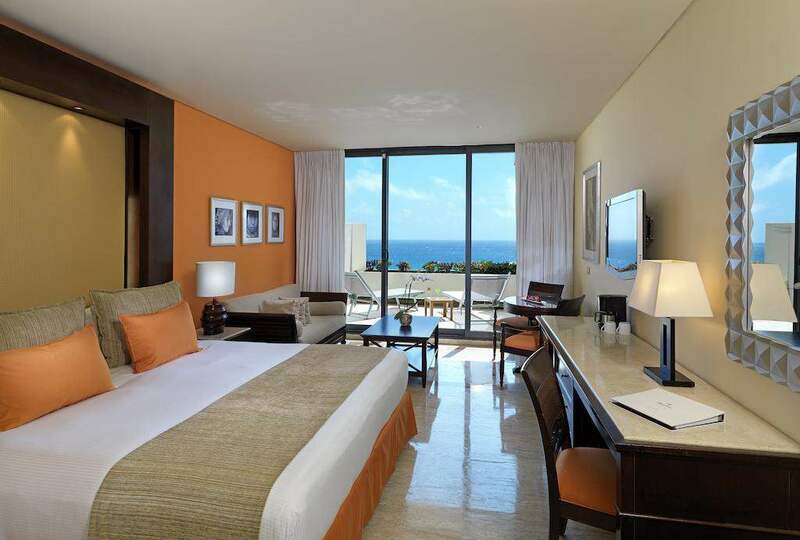 I would recommend booking the ocean view even though the lagoon view is nice too. We will be back. Thank you for the great vacation! 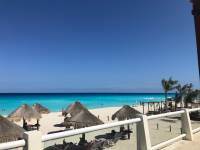 My Fiancé and I recently enjoyed a 5 night/ 6 day stay at Paradisus Cancun (9/23-9/28.) With recommendations from a close friend, we chose to get the Royal Service, and boy we’re we blown away by it. From the second we checked in, our butler Daniel took excellent care of us. He went over all the restaurants with us and made us reservations for the ones we wanted to try for our stay. He reserved our pool side cabana for us everyday, had rose petals and chocolate strawberries and champagne waiting for us back at our room after dinner. Needless to say, this place and the staff went above and beyond our expectations. One of the Royal service staff members, Ricardo, was phenomenal. We are already talking about our next trip down there! All the best to say about the Paradisus: immaculate property, excellent service, so easy and relaxed. Just back from celebrating my mother’s 80th birthday. They accommodated our party of 12 with comfort and panache. 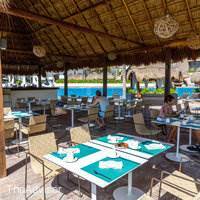 Don’t miss Mole & Fuego restaurants...AND the swimup bar. My only criticism is the lack of AC in the common spaces. 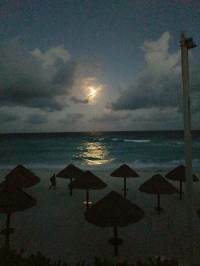 Originally planned to go to Cabo, but switched last minute to Cancun due to weather situation. So glad we picked this resort! The associates were very friendly and helpful. My family and I stayed in the Family Concierge area. Josue and Fernanda (assigned to our family), were very accommodating and attentive to our needs. Josue was proactive in making sure our stay was a pleasant one. All of the servers, including Hector, Abraham, Santiago, Diego (DD), made our dining experiences great. Some restaurants require reservations, so be sure to make them in advance. The resort also offers childcare during the day in the event you need it. This is our second time at this resort and they did not disappoint. Their service and attention to detail is insane! Food options were upgrades from last time and it seems they keep outdoing themselves. We paid extra for the Royal Service. It was absolutely worth it. If you get it, make sure you try their separate pool and restaurant. Impeccable service. Huge shoutout to Maria from Royal Service, Andres at the pool bar and the dynamic duo of Samuel and Oscar at the Avenue Bar. If you plan to travel, try visiting in October. Occupancy is a little low, so you get to enjoy the extra attention!! This past weekend I had the chance to stay at this resort for work from Monday through Friday. The resort was fairly empty, I would guess around 50% occupancy. Upon arriving the people at that front desk were very nice and helpful, with the customary cooling towel. I was checked in and given my wristband, a sort of colored nylon fabric with a wooden token intertwined with the fabric. I was taken to my room with the help of the bellboy. The room was very clean and nice with a King sized bed. The air-conditioner worked very well, which was really helpful as there isn't a ceiling fan, which made me sad. The mini fridge is stocked with water, snacks, and a variety of malt beverages. There are no liquor spirits in the room at all. I am not a fan of this at all, though I didn't consider calling anyone to see if that could be changed. The bathroom is a good size, and is elevated about 4 inches off the room floor, which my big toe repeated found throughout the trip. 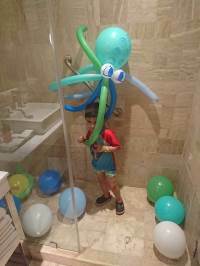 The shower has great pressure and heat, but is also again elevated a bit off the bathroom floor. If you have arthritis, or bad hips, etc, etc, I would consider finding a different resort as you will have difficulties getting in and out of the tub. The property as a whole is a smoke free environment, save for a few designated areas, though I did see quite a few people smoking in various outdoor areas without consequence. The buildings are very pretty inside, but the common areas are either not air conditioned at all, or are so poorly done that they feel as though they aren't. The restaurants were all comfortable except for The Market Grille, which is outside so this makes sense. The restaurants are all next to each other, and in a few instances we were seated in closed restaurants to eat in in a restaurant that was open at the time. This is how close they are to each other, which made for some confusion. I never had the opportunity to make a reservation and eat at a nicer restaurant because I forgot pants and didn't want to break the dress codes. It didn't alter my experience at all I believe. The room service is actually some of the best I have ever had at an all-inclusive resort. It was also delivered about 20 minutes after it was ordered, which is far and away the fastest I have ever had. 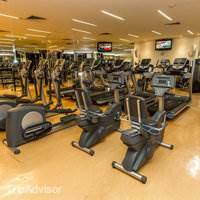 The gym was nice, A/C'd and a great place to get some exercise in with cable machines, free weights, treadmills, and ellipticals. I was very happy with this amenity.The Pools are all nice and clean, there aren't any floaties and I didn't see too many people who had brought there own actually. The music was never too loud and a good vibe. 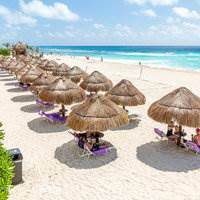 The beach is kept very clean and is pretty expansive and deep for Cancun. I did not at all appreciate the bars near the pools closing before the pools close. Not a fan at all.Overall this was a pretty nice place. If you are in decent enough shape to get in and out of the tub, and love the hot weather, this may be a good option for you. What can I say: you get what you pay for! 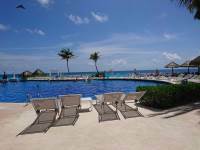 Excellent all-inclusive hotel with lots of facilities and many in-house dining. Strongly recommend upgrading to the Family Concierge or Royal Service - totally worth the extra pampering you get. A big thank you goes out to Maria, Alex and Josue who were very attentive and helpful. They made our stay so much more relaxing and comfortable! Also a big shout out to Luis and Orlando, waiters at our favorite eating places. 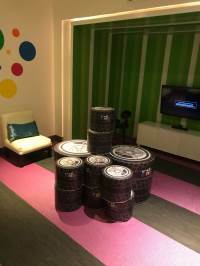 They remembered exactly what we liked and were always helpful and patient with our questions. Look forward to returning again! PS: there is a turtle conservation program that is run by the hotel! 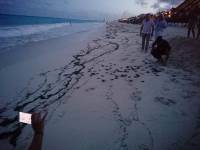 We had the privilege of participating in the release of hatchlings into the sea! It was a great family moment! Thank you to our concierge for inviting us! After returning 2nd year in a row we noticed these differences, all the restaurants were not open,buffet had limited choices during lunch and dinner,nightly entertainment was sporadic and could have been more organized.Last year all restaurants were open,plenty of choices at buffet,and nightly entertainment very well organized every night. Overall had an amazing time with family. The view and the beach took my breath away. Most beautiful lobby I’ve ever seen. Location can not be better. I had a full time butler that would make reservations for us and kinda follow us around to make anything possible! So yes to family concierge since it was me and my 3 teenage boys. Can’t wait to go back. ❤️Ps any picture you see on the website, it looks exactly the same or even better. My family and I stayed in a lagoon front room with two queen sized beds. We are a family of 4, my wife, 6 year old daughter and 7 month old baby-boy. We were worried about how the baby was going to react but everything went great from the moment we checked in, (which was rather quick) until we left. The staff is very professional and very well trained on customer service. 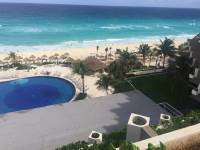 The first day, there is a person that will try to sell you the melia club package. GREAT BUT did not reimbursed my money...CHARGED ME TWICE. The hotel is great, breath taking. The services is excellent. The food, OMG, the food. However, THEY CHARGED MY RESERVATION TWICE. I forgot to bring the credit card with which I paid (booked online) and they didn't honored it even when the reservation was already charged and money was withdrawn from the credit card. Because I didn't show the plastic credit card at check in, they asked for another payment method promising they would reimburse the money from the original credit card. It's been almost two weeks since then and I am still waiting for the reimbursement. I even had to request a dispute with my credit card company to get my money back. 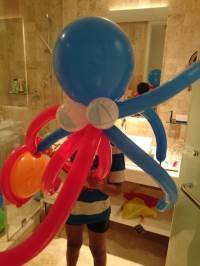 My fiancee and I stayed in a Lagoon front room for 4 nigths and our only regret was we didn’t stay longer. Clean, beautiful & spacious room. Lots of choice restaurants in the all-inclusive package which i’ll recommend. We had an amazing experience and will definitely go back again! 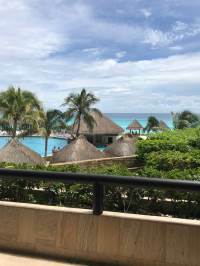 We just got back from cancun and stayed 3 nights at paradisus cancun. 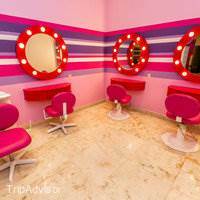 I do not understand why they get good reviews from others, but my experience was horrible. Do not go there unless you want to ruin your vacation. 1. servicePerson who checked us in was rude with rigid face, did not have any intention to help. She lied us they are out of bracelet pass(they give you a bracelet that can be used as pass to all the restaurant) when we asked to change it because there were ruff spot on metal part. She had bunch of bracelet right next to her. After 30 min check in, a lady held us for another 30 min for timeshare presentation. We paid full price to book this resort. I did not expect that coming. After we said multiple times "no" she let us go, next morning she ignores me multiple times when we met in the lobby. Asked for house keeping in the morning, they came 8pm after we called 3 more times. They do not know what restaurant is open/close because it changes so much.Kids club was good except they need to change their floor. My feet turned black after staying couple hours there. So, we had so much issues, I decide to address this, all they did was saying "I am sorry" without eye contact. 2. propertyNo air-conditioning except rooms. Its true I felt like I am in sauna every night at restaurants. very limited restaurant. They rotate restaurants to close diff days, so we ended up eating lunch at the same place for 3 days. Servers they do not know about Menu so you need to keep track what is coming or not. Portion was very small but often times they eliminate couple orders themselves and then say "it was not in order." last night we stayed, I figured I should wrote down my own order and kept track if everything is there. Sure enough, they missed couple dishes, I showed my writing, only thing they do is "sorry" and move on. Pool area was under construction. (Close to kids swimming pool). They sprayed paint around the pool while people are swimming right next to. 3. management Best part was I felt like no one was listening. I addressed issues, but all they could do was saying " I am very sorry." It was less than two star hotel service. I really hoping someone see this type of review serious and apply on their upcoming trip because they are overrated for sure as of now. This hotel was excellent! We went for a wedding and were not sure what to expect and it was awesome. The location is perfect because it has a huge beach and it right on the bus route to town ($1 each way) if you wanted to leave the hotel. 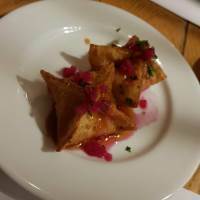 The food at Tempo was an extra charge but it was the best tasting menu we have ever tried. The margaritas at Blue Agave were really good and the food at Vento (tapas style) was yummy. We stayed in the Royal Service 1 bedroom ocean view suite and it was amazing. 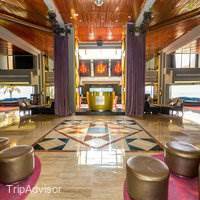 2 balconies, 2 bathrooms, room to hang with friends and family and we really like the Royal Service bar at the bottom of the pyramid and the extra restaurant for breakfast and lunch. The Royal Service pool was nice and quiet and the service was excellent. The hotel carries a nice selection of high end alcohol so you can easily find something you like. The one downside to the resort is how long it is. We had some elderly people traveling with us for the wedding and it was hard for them to walk from one end to the other but most of the services and restaurants are right in the middle.We will defiantly be returning to the hotel in the future!! This was A honeymoon trip. Check-in was great, prompt and quickly given our room. The room left much to be desired. The furniture was dated, and there were dirty curtains in the room and in the bathroom with stains that were so noticeable but have not been tended to. The mirrors in the bathroom and behind the door where rested and the paint falling off the door. The rails to the sliding doors how much accumulated grime dirt and dust which was hard to look at and shoukd be steam cleaned immediately. The hotel grounds were neatly kept up every day, there was lots of foliage which made it look beautiful, but all over the hotel it was warm and humid as it is open and AC vents should be added and turned on in the hot weather to help with comfort level of guests especially in the indoor restaurant Bana. We sweated through our dinner that night.The restaurant food was good. We did not get sick throughout our stay. On Wednesdays the buffet has seafood and the lobster was amazing. We tried all of them except two restaurants which were part of the Royal service side. 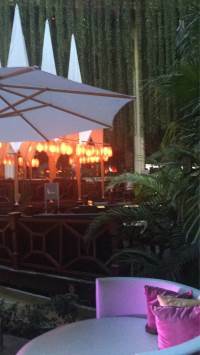 Outside pool area bars and snack bar had a great service and staff was friendly. The Cocoa bar staff however ran things a bit differently, we were only given top shelf liquor which was on the shelf and clearly available if we bargained tips. 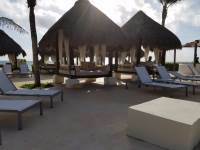 This was odd because we were given the same type of drinks or liquor such as Hennessey at the pool bar and other bars around the hotel without a request for a tip before providing it.The beach was amazing. 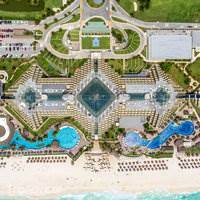 This is the best area for water in all of Cancun, the hotel zone which ones all the way from down south beach palace to the top point- so any hotel in most of this area is great . Some seaweed in these months at different points in the hotel zone beach stretch doe to the tides and it being rain/urricane season but it was not much even on this trip. Overall this hotel is noted it self to be a five star. It felt more like a 3.5 or four people, and the room felt like at three. 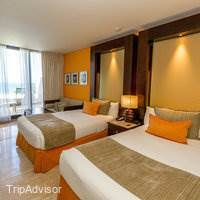 We would recommend it for the beach and the staff, However comfort level and room we would not recommend. We do not see ourselves returning to this hotel, hopefully they update their rooms. 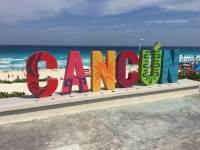 Hi there,I have been to Cancun 5+ times. 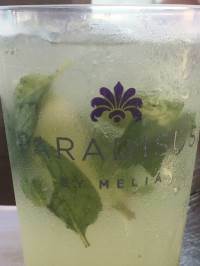 Have stayed at the Ritz Carleton (not all inclusive); Oasis; Bahia Principe, and I can't remember where else; but Paradisus by Melia has been by far my most memorable and satisfying experience thus far. 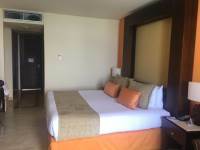 I'll give you a high level overview of what I consider important:Room: our room was always clean, neat and tidy and excellent AC system. Sure there's 1-2 things that were deteriorating ex: terrace door was rusting in one corner -no big deal! (but this is obviously due to humidity) and some wood panels from the bathroom's door were broken (yet again for the latter reason). Also, the look of our room was rustic (which we liked) but if you're looking for modern/minimalistic 'feels' you better pay more and stay on the royal service side or go to Le blanc or Acqua (higher end hotel$$$$). Food: it was incredible. I am of Mexican descent and I put my stamp of approval on the tacos at blue agave. Here is in order of preference (from favorite to less favorite) the restaurants we tried: 1. Mole and Blue Agave; 2. Market Grill 3.The buffet (brekfast, dinner, lunch). 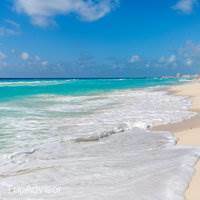 Beach: Cancun beaches are beautiful. Although 1 day there was sargasso at the edge of the beach (so just walk a little past it (4-5 meters) and then it's clear (depth there is 2 feet/69cm), but the day after it was gone completely. The hotel: Please remember you are in the tropics (to all those people saying the hotel smelt strange or whatever) and there's plants all over the hotel (which is beautiful and part of the decor), and humidex of +70% most of the time -that does not mean the place is not clean. Entertainment & activities: I can't comment here cause we did not attend these. We'd just be at the pool/beach drinking and mingling with people from everywhere all day or at the gym (which is in A+ shape). 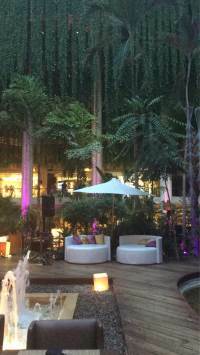 The live bands are a great touch!Overall, I am extremely impressed with this hotel. 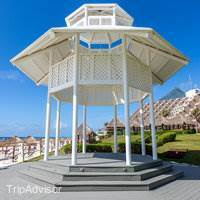 My boyfriend and I agreed that whenever we plan for a destination vacation again we will hands down, make an effort to only stay at a 'Paradisus' or 'Me' by Melia. Most importantly, I wish for management to commend/reward their staff for being so hardworking & lovely, gentle people. These folks were outstanding: Efrain (Blue Agave); Armando (buffet); Freddy & Giovani (pool bar); Sergio & 'Manager' [can't remember name] (Mole); Angel (reception); Consuelo & Emigdio (Market Grill); and to whomever cleaned our room. YOU ALL ROCK AND WE MISS YOU! 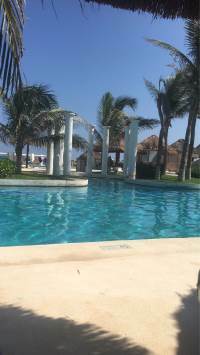 amazing , great service , beautiful pool , great food , very happy stay !!! 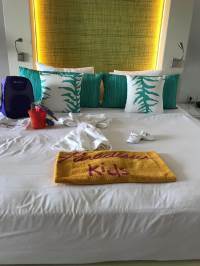 !room where clean , sparkling , pool area great , kids have a kids camp , good feeling the entire hotel , we will definitely coming back , thanks to the people at the grill restaurant great service thanks for all the mojitos !!!!! Hot and hotel of no!!! Great hospitality but everything is no no no. No to sitting you if your party is not complete no to moving a chair for an old lady to sit on no to connecting room no to late checkout and we went during low season can't imagine what it's like during peak season. Every place in the hotel is hot and humid. I thought I wouldn't mind when I read other reviews but can you imagine having every meal in a sauna??? That's what it's like. And kids zone is filthy!!!! I understand it gets dirty with kids but it hadent been cleaned in maybe weeks!!! It's an amazing place for a family vacation. The hotel is in a great location. It's nice and clean. The beach is fantastic. The pools are great. The food is amazing. The stuff is so hard working and everyone is nice, knowledgeable and helpful. I have to mention our server at Mole, Sergio, we received outstanding service from him. There are 8 restaurants and a buffet. Restaurants require reservations. Every night there was entertainment.I warmly recommend this resort for every age, perfect for kids and for adults. 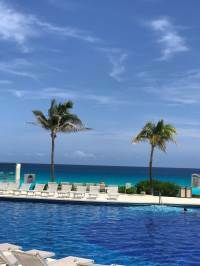 Went with a large group (ages from 4 to 75) late August and everyone had ball!Family concierge ocean view is the way to go - we got wonderful service from our concierge Fernanda, who helped with reservations and useful info. 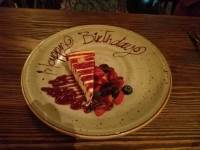 She also did something nice for my mom's birthday, which made it so special. And the view was spectacular! Try to get a room on a high floor for great view and less noise from the pool.Check in was a breeze in the air conditioned FC section. 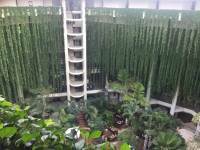 The hotel is lovely - beautiful atrium reminded me of a cenote. 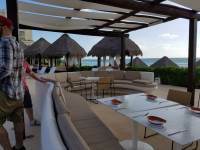 The restaurants were very good for all inclusive. No complaints about the breakfast buffet and for sit-downs, my favorites were Mole, blue agave and the market Grill. The coffee stand is a must, as is the crepe stand.The staff is awesome - helpful and unfailingly friendly. Loved Veronica, a waitress by the pool.The only drawbacks are the pool was being renovated and it got quite loud near the workers. Also the pool is large but ridiculously deep! Don't understand why the shallowest point (other than the kiddie area) is like 5 '4". Overall, everyone in my group had fun, even the teenagers! 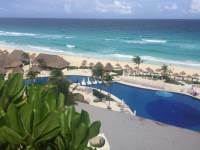 It was our first time giving the all-inclusive resort a go, and Paradisus was a great start. 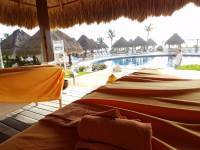 If you are in the mood for a relaxing, no hassle vacation, this is a great place to go experience that. 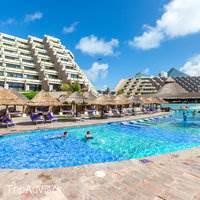 If you have kids who like water parks, this place does not have any of that, but we were very happy to travel with our 3 year old and just enjoy the pool, the beach, good food and great service. Rooms could do with an update in the next couple of years, but were clean and comfortable and the service is great. Only negative was the sales pitch for a time-share (via an invitation to a presentation over breakfast) right at check in, when all you want to do is go to your room for a hot shower and some rest. We went when the resort was busy, but post-peak season, so reservations at the different restaurants were not an issue, but may not be the case during peak season. 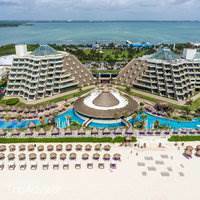 If you're considering booking a stay at Paradisus Cancun...Just book it! You will certainly not be disappointed. I don't have one bad word to say about this place, from the second we arrived we didn't have to lift a finger. The grounds are beautiful, both indoors and outdoors. All the staff are incredible and go above and beyond to make sure you have a great holiday.The standard of food was so impressive. So much to choose from and all high quality dishes. 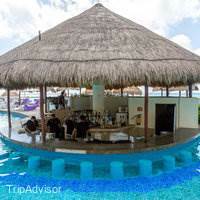 The drinks were great, you barely ever had to wait to be served, the bar staff work so hard to make sure your drinks are always topped up by the pool or on the beach.If this is your first time visiting Mexico here are two things to remember:-If you are happy with the service you received, you are generally expected to tip. It doesn't have to be a lot, but it is just the polite thing to do here as the staff are working hard all day in the sun. -Ignore the weather forecast, it's always wrong. The forecast for my trip said it would rain every day of the holiday...it only rained once. Perfect sunshine every other day.No review is going to do this place justice, just go and experience it for yourself, you'll have an amazing time. I just hope Paridisus would clarify the fine print on what was purchased and booked. I booked a Kings size bed not a two twin size bed. I felt Karen and Sergio was giving us the run around, either give us an upgrade or give us the bed that we purchased. We stay in the Royal Suites. Our butler Edwardo was excellent. He made our dinner reservations, cabana bed reservations, sent 4 liquor bottles to our room, chilled champagne & glasses with romantic flower petals (twice). The nightly bed turn down with chocolates and bed "runway" lights was also very nice to come back to at night. The restaurants were all wonderful! 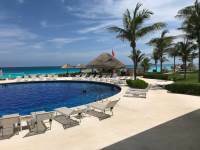 I have stayed at a half dozen different places in Cancun and I will definetely return here. Excellent place! 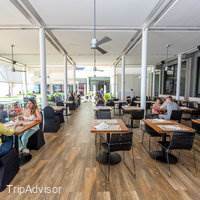 The main thing keeping me from rating 5 stars is the fact that tipping is expected with everything you do (especially in the restaurants and by the pool side). If you want excellent service instead of okay service then be prepared to tip, even though you are an all-inclusive guest!!! My wife and I loved this hotel's beauty and ambiance. Stunning. 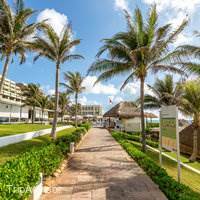 We have traveled to Hawaii, Las Vegas, other locations in Mexico, Bahamas, Florida Keys....but we have never seen a more beautifully decorated, landscaped, maintained, and designed property. 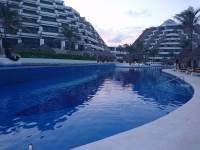 We loved the pool, the beach, and the service was top notch in all of our experiences. Tips are well deserved. These people work hard serving the guests! Notably, Miguel (or Mike as we called him) in the Naos restaurant, pm, was the best of all. With our every visit , he made us feel welcome, and went above and beyond our expectations. 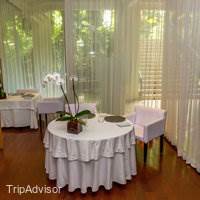 Miguel really made our stay and dining experiences fun and memorable. We truly enjoyed our stay, and hope to return one day. 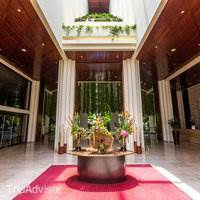 I deal with the Melia White House in London so knew what to expect of the brand. On entering the hotel it is distinctly Melia, but this is where it ends. For what is advertised as a family Hotel I cannot believe that pretty much all of the main pool is nearly 6ft deep with steps down into it that are not marked, the last one is a large drop down. At check in no one mentioned that there would be maintenance work ongoing throughout our stay (mid August) and there where no warning signs around the hotel either. 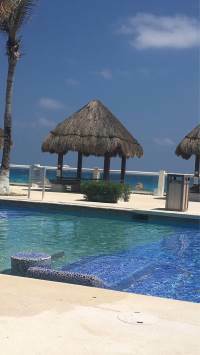 We would have to use a different staircase to the pool side, hearing banging from the room next to ours as it was renovated, the Sunset Grill not open for the first few days. One day we walked in to our room and it completely smelt of paint. My husband went to reception and they said they would send a maintenance person up. A cleaner was sent to our room! She did not speak English, (I do not have a problem with this but when you have clearly been to reception speaking English you expect someone to come to you who will be able to communicate with you) in the end the cleaner put me on the phone to talk to someone who said they would send a maintenance person!. They never materialised and the only reason we did not complain again is that the smell did go by the time we was going to go to bed. The last few days all of the sunbeds by the shallow end of the pool was shut off but with no screen to the pool, meaning that although children could use the shallow part of the pool dust was constantly blowing across this area. The restaurants are not geared towards children at all. If you have a fussy eater it is very hard to find food that is plain! Turn down was erratic. The beds are ridiculously small! My husband and I are not large people and to have a more comfortable nights sleep my husband slept on the couch! 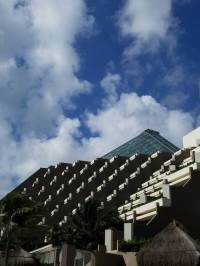 We where in pyramid 3 for our stay which is convenient for being near the restaurants and reception but if you want to be able to get your children to sleep at a reasonable time I would suggest you avoid this pyramid as there is regularly loud music late into the evening. On the last day we had a cockroach in our room! Thank goodness that was the last day as I would not of been comfortable staying after that, there may be a lot of plants but I still don't expect one of those in my room. Kids Zone was the best thing about the Hotel, the staff here are lovely and made my children feel very welcome for the hour or two they spent there a day. My experience there was horrible from the time we got there until the time we left. We always book with family concierge. 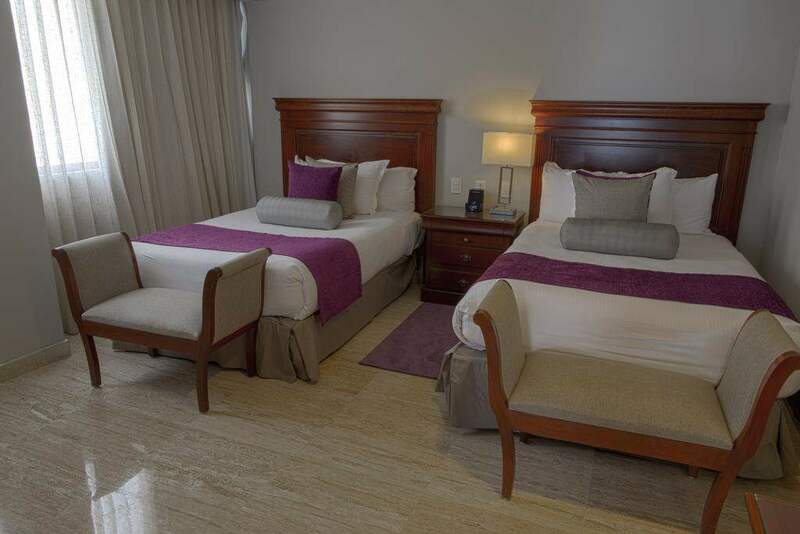 Upon our arrival, we have called ahead of time and requested that our room be ready upon our arrival, we were assured that It would be taken care Of. When we got there we were told we had to wait three hours, after arguing with them for 20 minutes they finally gave us a room, which had unsafe conditions because broken doors. I asked the butler to call maintenance to have the door fixed, four hours later when I called him to see if it was fixed he said that he was only going to call them now! as we were going back to a room we were denied access because they shattered the glass door in our room, so they decided to change your room without our consent. Our butler was so horrible in an experience he even forget to make reservations for dinner, which I had to remind him to do again. With exception to want to restaurant, the food there at the restaurants was horrible. And one of the restaurants for dinner I decided to order a duck, the chef had no idea or clue on how to properly prepare that dish. It came out overcooked and dry inedible. They really take it off the menu of they don't know how to properly prepare that dish. 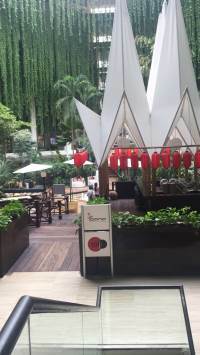 Another thing about the restaurants is that I don't thing that they turn on air-conditioning in the restaurants because it was very hot and humid I literally had to step out of the restaurant several times and go to a concierge lounge to cool off. 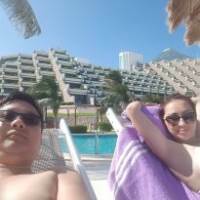 At the pool and beach area, be prepared to pay extra if you want to use the beds which were over $100 per day.House keeping room service was ok for the most part until they forgot/neglected to clean my room. Unacceptable! AMAZING hotel! 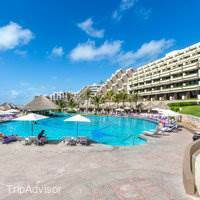 Loved everything, excellent service from all the employees, amazing food in the breakfast buffet, excellent food in the lunch buffet, good options on the poolside, great dinner buffet, and Fuego restaurant its delicious!!! The gelato stand was also very good.For some reason we were given a room in pyramid 1 which is for Club Melia only and it was great! The lobby and hallways are very impressive with lots of vegetation.I visited the Yhi spa and I had the best experience ever, loved all the hydrotherapy and the massage was best ever.The bar was very good and the waiters at the beach were always with a very good attitude.Loved everything about this hotel and for sure will be coming back. 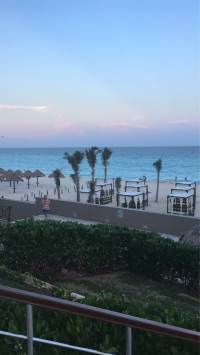 I traveled from August 10-15 2017 from arrival until departure the entire stay was incredible- if you read my other hotel reviews I have above average standards when traveling. 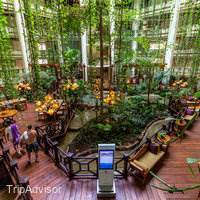 I was a bit nervous as I have never heard of the Paradisus upon arrival you encounter manicured grounds, five pyramids, and attentive staff. We were escorted to registration where it was a bit dark which made me nervous however the staff were friendly, efficient, and explained the all inclusive process. We were informed of the multiple pyramids and where things are located. We were escorted to our room it is unfortunate I do not recall his name he was incredibly pleasant, told us abut the hotel while walking us to our room (be prepared to walk if you stay in pyramid 5 however it s WORTH IT!! 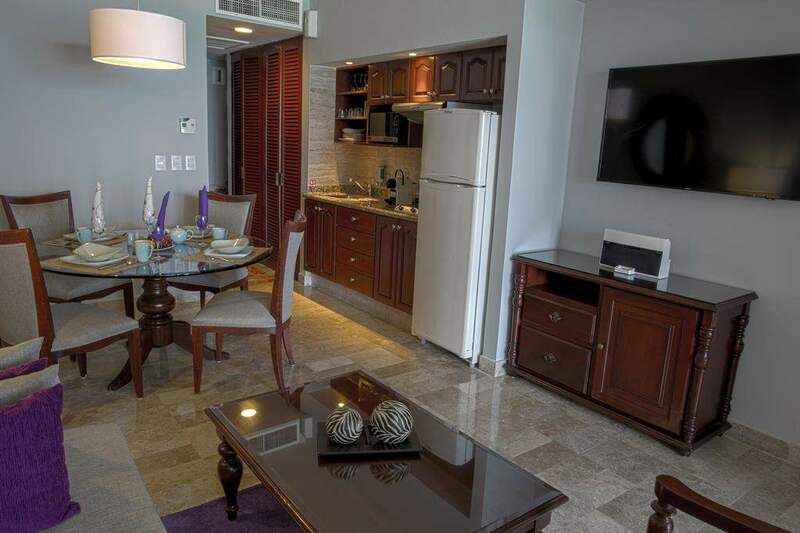 The room was a 1 bedroom suite with 2 bathrooms 2 balconies, a stocked mini fridge, and a living room. The room was beautiful! It was clean, well furnished, beyond spacious, and overall exceeded my expectations. We were celebrating our anniversary and were welcomed with a heart made of rose petals on the bed. That was the beginning of a week long amazing vacation. 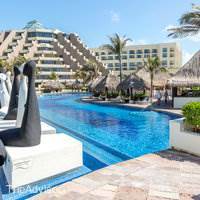 The Royal Service allows you access to an exclusive pool that is not crowded and an exclusive restaurant that offers AMAZING customer service as well as excellent food choices. ALL of the staff was polite and genuinely friendly. During the entire week I did not encounter one negative experience which is unique as I have high expectations. Some staff went above and beyond excellent customer service I have waited too long to write my review so I do not recall names however they work in the exclusive restaurant for Royal Service. Some reviews say it is not work the upgrade I do not agree, it is well work the upgrade. 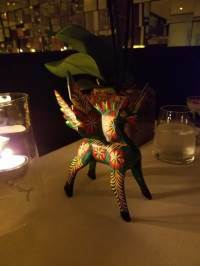 The food is amazing, the drinks are great, the service is the best I have encountered anywhere. Please remember to tip. 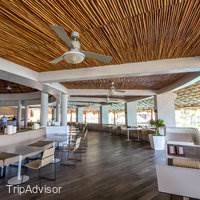 the resort is all inclusive and it advertises that gratuity is included however the level of service is well worth tipping. 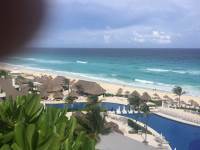 I highly recommend the resort and will be returning the next time I travel to Cancun. Outside of the resort we traveled by bus (it was $1 US dollar) (cheaper if you use pesos) the bus runs every few minutes up and down the hotel zone it felt safe using the bus, they were clean and the drivers were friendly announcing your stop if requested. The lobby is gorgeous... But that's all.Check in lady is very unfriendly (belive her name is Karen )charged us twice for the room, even though we told her we've already payed.The ROOMS are very outdated, and smells like mold. The materass is old and uncomfortable,The toilet is inside a closet the tub/shower is very old The KIDS/BABY zone is very dirty and unsanitary.The BEACH is not stroller accessible.NO KIDS POOLThe SERVERS are very nice and polite, that is the only reason why I'm giving 3 stars otherwise I would have given 1.THEY SHOULD PUT THE SAME EFFORT IN UPDATING THE PLACE AS THEY DO IN PUSHING YOU TO BUY A 50 YEARS MEMBERSHIP.ABSOLUTELY NOT A 5 STARS RESORT! MORE like A 3 STARS RESORT. We stayed at at the hotel last week of August. The resort is amazing inside and out. We stayed in family concierge, but we did not have the perks of family concierge (which was alright). The deck is amazing, we had an ocean view. The way the deck is built is unique, no one can see into your deck. We also had 2 outdoor chairs to sit on. The first two days when we arrived, tropical storm Harvey was just leaving, and we were in a downpour of rain. 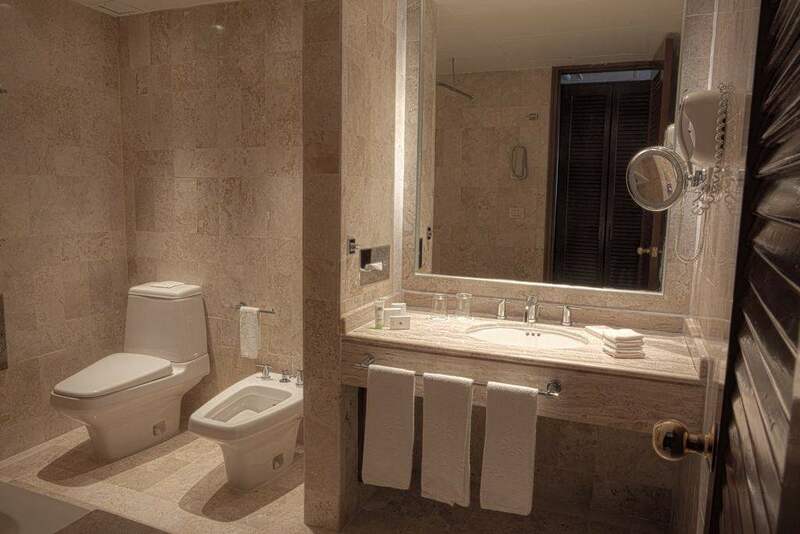 The hotel leaked a little, but staff were quick to clean up leaks. 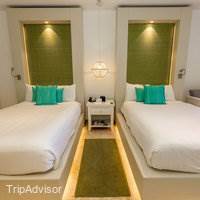 The rooms were amazing, cleaning staff did a very thorough job cleaning. There was also turn down service available. The only downside is that our room usually got cleaned at 2 PM, so even if we were out swimming all morning, we did not have towels to shower when we came back to our room. Mini bar was always stocked, however he never seemed to get enough water, it was one easy call to house keeping who would bring us water when needed. We ordered room service the first night, stay away from the pizza, definitely one of the worst I've had. If you want a piece of pita with sweet sauce, then go for it. During our stay, we are often at Naos (the buffet). Always a good selection of food, and staff was externally friendly and helpful. Notably, I would like to mention a few staff that made our stay amazing. Omar Garcia, thank you for introducing us to the Alfonso Trese drink. Your friendly attitude made us always seek you out at the buffet to be our server. A few others to mention, Orlando, Arlmando, Martin, and Miguel. You were all amazing servers, made our trip so much better with your friendliness. Also to mention Ascucion who went served us on the beach several times, we never got a chance to thank her. 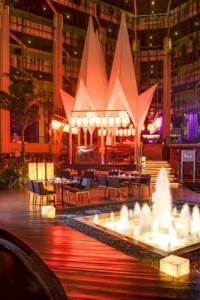 At Paradisus, there is an Aqua World, so no need to go across the street to book excursions. 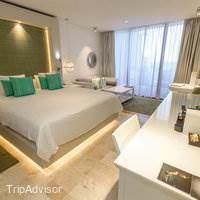 Go straight to Aqua World staff, unless you want to be sucked into a presentation with guest services to buy a timeshare to potentially get a discount. Aqua World staff is knowledgeable, and will book you for a trip. I booked a scuba diving trip through Fernando. The pool was great, both of them, and the ocean was beautiful. Lots of chairs to sit in, usually not too hard to find. During our stay, flags on the ocean most of the time were Red, however, we were still able to enjoy the ocean. Shows were decent at the hotel, however were repetitive. We seen Elvis and Michael Jackson twice (MJ was a great show though). I will mention the show that happened while MJ was getting ready lacked, and the singers were horrible. When the shows were at Avenue Bar, it was hard to see as the crowds were large, however when the shows were outside, there was lots of room to see. 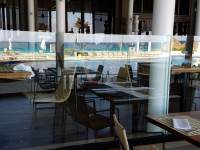 We only tried a few restaurants at Paradisus. On the first day we tried Blue Agave, it was very distasteful, and we left our meal and went to the buffet. We never returned to eat at Blue Agave. We made reservations at Vento, which offered a lot of food, 2 appetizers, 1 main dish, and 1 desert (with all inclusive package). Decent food, we enjoyed it. We also are at Market Grill which is an Argentinian style grill where hey bring meat to your table. Excellent meat, great service. We also booked at Fuego. We were weary at first, but the sirloin was AMAZING, I would go again just for that meal. Wifi was alright at the hotel, it was very spotty at night however. 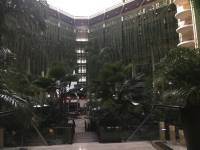 The lobby was also very hot, not much that the hotel can control as it is basically a tropic inside with all the plants. To note, the hotel also has a coffee shop opening during the day that offered coffee and sweets, as well as a ice cream and crape shop. Friendly staff there too! There is a store where you can purchase goods, and there is a money exchange inside the store if needed. Overall, this vacation was amazing, the hotel was amazing. 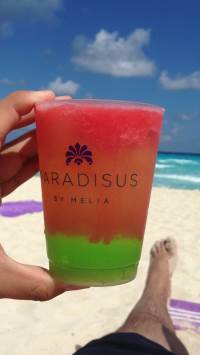 We will definitely be staying at Paradisus again and will be recommending it to everyone. First timers and it was enjoyable! We decided to celebrate our oldest daughters graduation of HS in Cancun... and we had a fantastic time. We spent 5 nights at Paradisus was fantastic. We had no plans other than to relax the whole time we were there, and we did just that. The check in process was a breeze, however, afterwards we were starving and just wanted to grab some lunch and we were stopped by the salemen (for about 20 minutes) trying to get us to commit to a 45 minute timeshare breakfast. Although I do have to say, he took No thank you well and we were on out way. Our room was clean and the air conditioning worked perfectly! The only downfall of this resort is no air conditioning in the common areas, makes it hard to want to explore the hotel when you just want to get back to your room in the AC. Specially in the Summer months when it's 90 degrees and 75% humidity. The maid service was fantastic! Our beds were made daily and we never had to worry about having fresh towels. If we ran low on water, a simple call and they had it up to our room within minutes. I love the personal experience that once the items you request are delivered they call to make sure you received them. We ordered room service one night, it was great. Every restaurant we tried was okay ... it was annoying that you had to book 2 days ahead of time. Knowing that before we arrives I was able to make the specific accommodations. We were VERY CAUTIOUS about the drinking water, we brushed our teeth with the bottled water. Of course I was the only one to get side the last 2 days of the trip. Not sure if it was something that I ate or the water. Jose at the coffee bar, super friendly EVERY morning! The ladies at the galato stand were always fantastic. I have to give BIG props to Luis, our pool waiter! He was absolutely FANTASTIC. Every morning we were down, got our chairs and he had a bucket of water and drinks coming to us right away! Being that we took our 18 year old she wanted to try every drink under the sun, he was so accommodating to her and bringing her whatever she asked. We took well care of him due to this haha. On our last day as we were leaving we told him thank you and he shook our hand. WONDERFUL WONDERFUL service! One minor annoying factor was the warmth of the water ... seemed like if you went first thing in the morning the water felt nice but as the sun heated the pool up it was like luke warm bath water, not really refreshing. It was kinda disappointing that the whole time we were there the flags were red or yellow at the beach. We had one green day, but the kids were always able to enjoy the ocean. First day my oldest was a little sore from the roughness of the waves, but we managed. 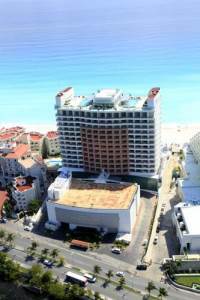 The location of the resort is perfect, we rode the bus downtown one day for shopping and let the kids swim with the dolphins and it was a 5 minute bus ride. Overall we had a wonderful first experience for the first time and I am so glad that we got to go! Thank you Paradisus staff!!! We had a great time at this resort. The property is beautifully manicured and spotless. The beach is clean, there are lounge chairs throughout and waiters to take drink orders. The food is high quality and plentiful with lots if options. Plenty of seafood but no lobster unless you are royal service. 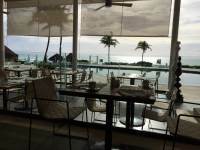 The a la carte restaurants are very good, especially Diego and Mole, reservations are required which can be made starting at 7am the day before. 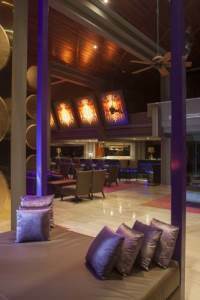 The bars are average, with a wide selection of hard liquor and beer, Heineken on tap at one of the bars. Otherwise local beers throughout. The service is impeccable. Special mention of Julio out waiter during breakfast. He provided amazing service and went above and beyond to maker is comfortable. This is an excellent resort highly recommend. It is family friendly and there are children around but it wasn't a problem for us. Customer Service was Excellent. Hotel Installations, not so Great.